We produced our latest client promotional video for Fastnet – The Talent Group, a great Cork company and the market leader in Recruitment, Talent Management and Contract Services in the Life Sciences sector. 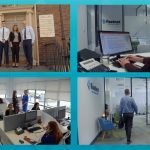 Fastnet have recently renovated their Cork offices and opened a Dublin office and they were primarily looking for a Customer Information Video to help to promote their business offerings. So they reached out to Videozoom for a solution. As a result of our initial consultation with the client, we created a production plan and a shooting schedule. Our crew arrived early at the Fastnet offices in Little Island and immediatley created a green screen studio setup to film the interviews. On day 2 we set about shooting all of the supporting footage with the staff and senior management. This footage included staff meetings, office environments, reception areas and the staff canteen. THe following day we traveled to the Fastnet offices in Dublin where we once again set up a green screen studio for interviews and then shot a series of supporting footage scenes. We used a variety of lens and our very cool motorised curved camera slider to capture some great footage for the video. The new client promotional video is currently featuring on the company’s Twitter, Facebook and LinkedIn pages. Reactions from customers and feedback from the client has been very positive and we look forward to working with this great client again soon!